Be the first to share your favorite memory, photo or story of Gloral. This memorial page is dedicated for family, friends and future generations to celebrate the life of their loved one. 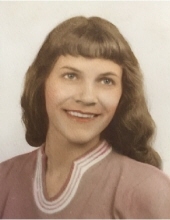 Mrs. Gloral Mae Hurst Madden, age 79, of Garrison, Kentucky, passed away Sunday, February 3, 2019 at Community Hospice Care Center in Ashland, Kentucky. She was born May 10, 1939, in Greenup County, Kentucky, a daughter of the late Raymond and Lacie McFarland Hurst. Gloral was a member of the Church Of Christ in South Shore, Kentucky. She enjoyed gardening, working in her flowers, taking care of her dogs and spending time with her family. Gloral is survived by her husband of 60 years, Glenn Edward Madden; one son, Jamey Madden (Peggy) of Garrison, Kentucky; three daughters, Glynnis Bivens (Tommy) of Quincy, Kentucky, Nancy Shelton (Jay) of Lucasville, Ohio and Vickie Turner (Steve) of Clarktown, Ohio; eight grandchildren; five great grandchildren; and one brother, Ray Hurst of Nevada, Ohio. She also leaves many other family members and friends who will sadly miss her. Funeral services will be held at 11 a.m. Thursday, February 7, 2019, at Globe Family Funeral Chapel in Garrison, Kentucky with Brother Gary Vaughn officiating. Burial will follow in the Granny Thomas Cemetery in Lewis County, Kentucky. Friends may visit from 6 p.m. to 8 p.m. Wednesday, February 6, 2019, and after 9 a.m. Thursday at Globe Family Funeral Chapel, 103 Dudley Avenue, Garrison, Kentucky 41141. "Email Address" would like to share the life celebration of Gloral Mae Hurst Madden. Click on the "link" to go to share a favorite memory or leave a condolence message for the family.